Seattle, WA : YWAM Pub., c2005. 183 p. : map ; 21 cm. A former Sikh, Sundar Singh found truth in Jesus Christ when he was sixteen and devoted his life to crossing the Himalayas many times in bare feet and with few possessions in order to share the Gospel with the people in the region between India and Tibet. 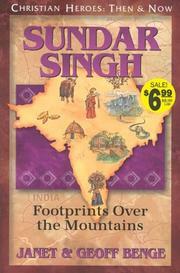 Sundar Singh : footprints over the mountains / Janet & Geoff Benge. 504 BibliogEtcNote $a Bibliography, etc. note Includes bibliographical references (p. 183). 505 ContentsNote 0 $a Formatted contents note He had saved his own life -- The path that will lead you to God -- The biggest shock of his life -- "We reject you forever" -- Sadhu Sundar Singh -- The life of a traveling Sadhu -- Across the mountains -- A caged forest bird -- "You are alive!" -- Into Nepal -- To the South -- To Tibet once again -- To the West -- In the footsteps of Jesus -- The perfect life. 520 Summary Etc. $a Summary, etc. note A former Sikh, Sundar Singh found truth in Jesus Christ when he was sixteen and devoted his life to crossing the Himalayas many times in bare feet and with few possessions in order to share the Gospel with the people in the region between India and Tibet.